Despite more than 40 years of empirical and conceptual research, the contribution of behavior analysis to the world of business remains relatively small and organizational behavior management gets little attention in both the academic and professional communities. Acceptance and Mindfulness at Work presents behavioral analysis of human language that's ready to use, with applied extensions proven to have a significant impact in organizational settings. The leading experts in the field examine how these ongoing developments can help broaden the exploration of the psychological issues relevant to organizational behavioral management (OBM) in the workplace. 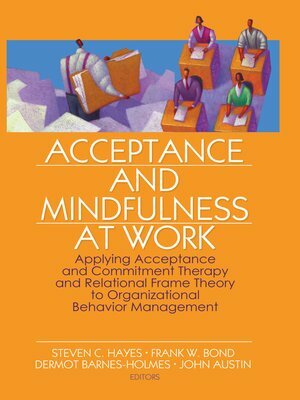 Acceptance and Mindfulness at Work presents conceptual and empirical articles, and reviews of working examples of Relational Frame Theory (RFT) and Acceptance and Commitment Therapy (ACT) applied to organizational behavior management. The book examines goal setting, feedback, task descriptions, and workers' ability to learn as examples of how to affect positive change in organizations through increased productivity and improved quality of life in the workplace. The possibilities presented by RTF can lead to advancements in employee safety and training, stress and health management, employee evaluation, managing absenteeism, tardiness, and turnover, and self-management. and much moreAcceptance and Mindfulness at Work is a vital professional resource for organization development practitioners and human resource managers.